Many skin conditions are misdiagnosed by doctors as brown recluse spider bites. This can lead to tragedy because about 40 medical conditions, including several deadly bacterial infections, can be confused with brown recluse bites. Dr. Rick Vetter, a retired University of California, Riverside, entomologist, along with lead author Drs. W. Van Stoecker and Jonathan Dyer, both dermatologists in Missouri who specialize in treating brown recluse bites, have co-authored a just-published paper in JAMA Dermatology that describes expressions of skin conditions that are often misdiagnosed as bites from this spider. 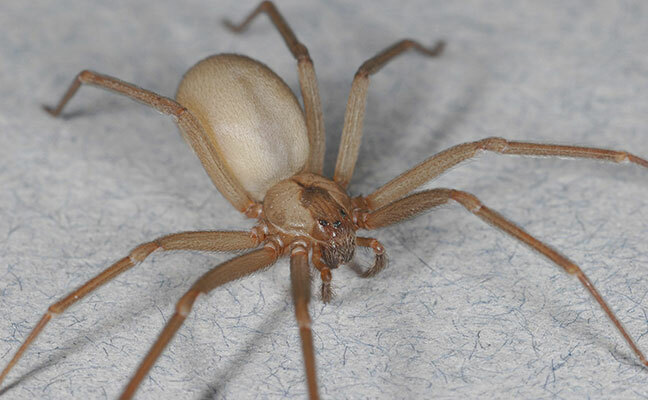 A University of California, Riverside, researcher published a paper about skin conditions that are often misdiagnosed as brown recluse spider bites. In the JAMA Dermatology paper, Dr. Vetter and the dermatologists from the University of Missouri Health Sciences Center introduce a mnemonic device – NOT RECLUSE – that they created to describe the most common skin signs that are misdiagnosed as brown recluse bite. For example, the REC of NOT RECLUSE indicates Red, Elevated and Chronic. Recluse bites are whitish blue or purple (not red), flat (not elevated) and don’t last more than three months. So, if a patient has a wound that is elevated or red or persists more than three months, something other than brown recluse bite should be considered. The authors also offer alternate diagnoses that are more likely for many of the acronym categories. For example, under the Red category, the authors suggest that a red lesion would indicate a bite or sting by another insect/spider or might be a bacterial infection caused by streptococcus or anthrax. Dr. Vetter developed an interest in spiders as an undergraduate student in the late 1970s and earned his master’s degree studying spiders. But, it wasn’t until 1992, when he was working as a research associate in an entomology lab at UC Riverside, that he started to focus on the brown recluse. Brown recluse spiders are no longer than a half-inch in body length and have a dark brown violin shape on their body, Dr. Vetter said. They are venomous, but about 90 percent of bites self-heal, about 10 percent result in a rotting flesh lesion, and less than 1 percent cause a systematic reaction that can be fatal, Dr. Vetter said. Since then, in his spare time – evenings, lunch hours, weekends – Dr. Vetter became a brown recluse spider expert. He has published on the brown recluse more than anyone in the world. Dr. Vetter has more than 140 publications in scientific and medical journals, including more than 100 about spiders with more than half of those about brown recluse spiders. He is also the author of “The Brown Recluse Spider,” the only book dedicated to this species written for adults. His business card has a picture of a brown recluse on it. He has named two spider species. Two spiders and a non-spider arachnid have been named after him. But, no, he has not been bitten by a brown recluse. One of his most significant contributions was spending years creating a map that shows the geographic distribution of brown recluse spiders. They are found in about 20 states, with the highest concentration around Kansas, Oklahoma, and Missouri. The map is on the web site he created, spiders.ucr.edu, which draws about one million visits a year. The JAMA Dermatology paper was the culmination of years of collaboration between Drs. Stoecker and Dyer, who developed a swab test for detecting recluse venom in bites, and Dr. Vetter, who has been documenting misdiagnosed conditions. It encapsulate 25 years of Dr. Vetter’s work as well as his colleagues’ 50 combined years of treating brown recluse bites in Missouri. Sean Nealon is a writer a UCR Today, a University of California, Riverside, news outlet. He may be reached at sean.nealon@ucr.edu or 951-827-1287.